The Standard PF-P330 Paper Folder combines the simplicity of a push-button set up with reliable mark-free suction feed in a table-top unit. 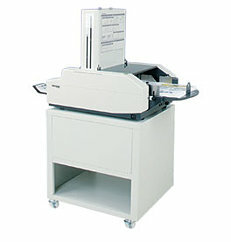 It’s easy to use and has a quiet operation which makes it a must for any office or print environment. If folding a variety of stocks that are printed by both traditional offset and digital printers is something you do a lot of, this is one machine you have to have! The PF-P330 has a 500 sheet feed capacity, a push button air control with vacuum, and a built in stacking conveyor. The PF-P330 paper folder feeds from the top of the stack and can lift the top sheet off and break it free from the static field that surrounding the entire stack. This paper folder has 6 presets: letter, half, engineering, double parallel, Z-fold, and open gate. However, there are 10 custom folds that are able to be programmed into the memory and can be re-written at any time. The PF-P330 is the logical choice for folding a wide variety of stocks quickly, easily, quietly and reliably. Sheets can be taken directly off a high speed copier and have them folded without waiting for them to cool because of it’s unique feed system. If you have any questions or are interested in purchasing the Standard PF-P330 Paper Folder, visit us at SpiralBinding.com. We have great pricing on a full line of Air Feed Paper Folders. Call us at 1-800-631-3572 for more information!